The scientists who made the surprising discovery of teeming life around hydrothermal vents of the Galápagos Rift in 1977 were geologists and geochemists. 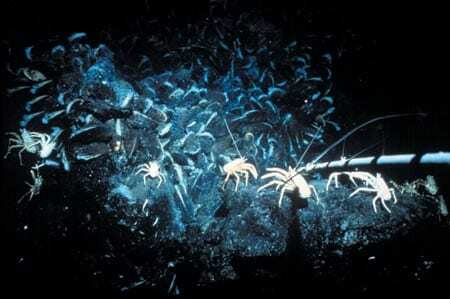 They had not expected to find spectacular colonies of previously unknown, large animals on the deep seafloor. It didn’t take long after the first amazing reports arrived for deep-sea biologists to mobilize a Galápagos voyage. Holger Jannasch, Howard Sanders, and I from the Woods Hole Oceanographic Institution, Ruth Turner and Carl Berg of Harvard University, and Bob Hessler of Scripps Institution of Oceanography (SIO) met in Woods Hole and decided to send the National Science Foundation (NSF) a proposal for a return trip. I would coordinate the proposal and be chief scientist of the expedition. After discussions with many colleagues, we devised a cruise on a ship with well-equipped labs, combined with an Alvin bottom-station expedition. We would subject the newly discovered communities to the full arsenal of techniques available to modern biology. 1) What is the basis for the origin and concentration of life at hydro thermal vents? 2) How have large organisms adapted to elevated temperatures, high pressure, and hydrogen sulfide? 3) Do the communities that characterize each vent represent a) stages of succession, b) discrete islands resulting from chance immigration, or c) organisms settling in response to different chemical gradients in each area? 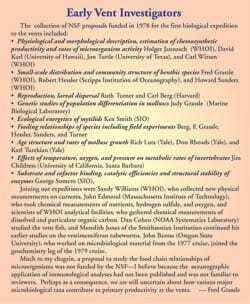 Our three-leg NSF program was combined with a geological study supported by the Office of Naval Research and conducted by Jerry van Andel (Oregon State University), Bob Ballard (WHOI), and Kathy Crane (WHOI). 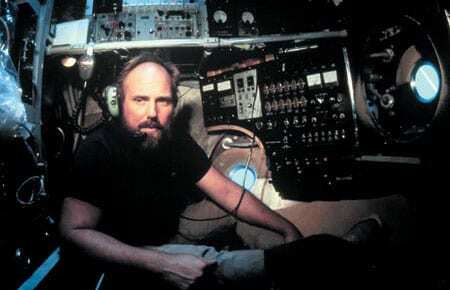 The Angus (Acoustically NaviGated Underwater System) team was led by Earl Young (WHOI). Ballard had negotiated with both the National Geographic Society (NGS) and Disney Studios concerning a television special. NGS won and, in return for the privilege of documenting our efforts, provided funds for five additional Alvin dives. Total research funds added up to approximately $600,000, nearly $200,000 of which went to equip and support Alvin. In the year that elapsed between submitting the proposal and sailing the following January, Alvin was extensively modified to augment its capabilities. NGS agreed to provide a pan-and-tilt system for a new prototype RCA digital television camera, which led to the addition of Alvin’s much-needed second arm. During 1978, we tested special lights for underwater filming. WHOI’s Cliff Winget designed a special basket to hold all the necessary sampling equipment within reach of Alvin’s arms. We built an elaborate multi-valved system, controlled by the flip of electronic switches, to pump seawater from any of an arsenal of nozzles into sample bottles—through either of two sizes of filters to sample microorganisms, or through a large hose, so that fragile animals could be gently slurped into a large, segregated container. We devised an insulated sampling container; a variety of samplers for microorganisms and particulate organic matter; a 35mm stereo camera with temperature probe; apparatus for incubation experiments; in situ respirometers to measure the animals’ oxygen uptake and hence their metabolism; fish, crab, and larvae traps; and a device for deploying plates to learn how larvae are dispersed and settle. Tetrahedrons of thick wire were alternately painted black and white every 2 centimeters to provide three-dimensional markers for photographs. The 14 members of the biology team who sailed on the first leg were distributed among WHOI’s R/V Lulu (Alvin’s tender), R/V Gillis, owned by the Navy and operated by the University of Miami, and Camelot, a sailing vessel chartered by NGS. When we arrived in Panama on January 10, Lulu was already there. Gillis arrived two days later, having run aground in the Panama Canal. Gillis was so stuffed with science equipment for subsequent legs of the cruise that we could not enter the labs. In the tropical heat, we unloaded several tons of this equipment onto the dock and then loaded many tons of our own equipment that we had shipped separately—with only one case of heat exhaustion, ably treated by Ruth Turner. Gillis was supposed to arrive at the vent site two days before Lulu to locate the vents within a patch of seafloor about 50 meters in diameter and 2,500 meters deep, some 380 kilometers northwest of the Galápagos Islands. However, an engine overhaul delayed the ship for two days and Gillis arrived at the same time as Lulu. As a consequence, Alvin’s first two dives had to be made away from vents while Angus, the 2-ton towed camera sled, searched for them. Ballard estimated that it would take at least 30 hours to locate the vents. The tense moments during a meeting on Gillis to plan the field experiments, filmed by NGS cinematographer Jim Lipscomb and shown in the 1979 Emmy-Award-winning NGS special Dive to the Edge of Creation, were genuine, as was the relief when a few vent clams showed up on the last few frames of a long series of photos taken by Angus. The work on Lulu did not go smoothly. There was difficulty with Alvin’s hydraulic system and dives often ended abruptly as the alarm for a hydraulic leak sounded—once before we even reached the bottom. After most dives, the hydraulic system was taken apart and the Alvin crew worked through the night and into the morning to fix the submersible in time for the next day’s scheduled dive. Despite the long hours, the crew’s morale remained high, and the pilots would tease “the most concerned scientist” of the day by leaving his—neither Ruth nor Kathy were teased—equipment off the basket until the last minute. At a precruise meeting near the end of 1978, each investigator had provided written notes specifying minimum needs, and these were invaluable in setting priorities during the first few dives. After six dives out of a projected 10 on the vents, four at a vent site dubbed “Mussel Bed” and two at another called “Garden of Eden,” the system that hoisted the Alvin cradle to Lulu’s deck level failed, and we suddenly had to start the long trip back to Panama (an especially long haul for those who had to endure the none-too-gracious accommodations aboard the slow-going Lulu). Even though each dive had been planned as if it were our last, there was still much to do. No one was very happy, even though we had accomplished a significant part of the work. During each dive, we collected many animal specimens and water and microorganism samples. We made in situ metabolic measurements of the animals, placed experiments, and took many photographs with the stereo close-up camera or the prototype RCA video camera. We did have some failures, specifically our current meter and thermistors, which produced no useful measurements. The animals collected during each dive were either sent to Gillis for physiological evaluation, preserved, or placed in culture. We were concerned about the effects of decompression as the animals were hauled to the surface and by the long transfer time between ships. We made adjustments: Jim Childress shifted from mussels to crabs for his laboratory physiological studies after our minnow-baited traps proved extraodinarily successful at catching crabs. When a specimen of a delicate orange benthic siphonophore (a relative of the Portuguese man-of-war) fragmented during transit to the surface, we fashioned on board a new sampling container to capture one intact. Each night, we held an intensive debriefing session with each day’s divers. By asking questions and recording the conversation, we began to develop a picture of the ecosystem and what was important. NGS photographers Al Giddings and Emory Kristof were full participants in the research and Al’s underwater video usually gave us better views of the animals than were available by direct observation through the Alvin’s small viewports. Even more important, the video images gave everyone, not only those in Alvin, an ability to see the animals. When we returned to the Galápagos vents for Leg 2 on February 9, the research shifted to Ballard’s geology program. But Bob made room for some biology on his five geology dives, and the five NGS-funded dives emphasized biology. These 10 dives on the second leg made a huge difference to the biology program’s overall success. When we left the ship on February 26, NGS photographic specialist Pete Petrone, who had discovered how to process color film at sea using seawater, provided each scientist with 20 of the best 35mm photographs taken on the cruise, and Emory Kristof supplied a tape of underwater video highlights, for scientific use only, until after Dive to the Edge of Creation aired. Eleven additional dives at the beginning of December 1979 completed experiments begun in the first two legs and added to the sample collections. By the end of 1981, the 1979 Galápagos dives had yielded 32 papers. My lab alone sent information and materials to more than 40 additional investigators. By 1986, the 1979 expeditions to the Galápagos vents had contributed to 79 papers. 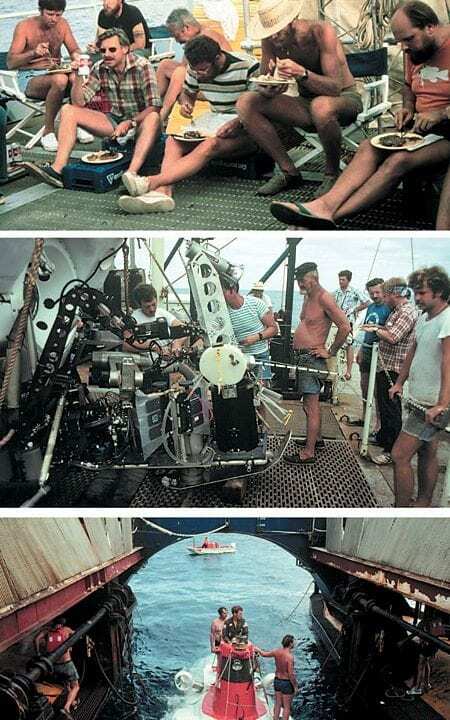 By then, most of the papers included information from vent systems explored by 1982 expeditions to the East Pacific Rise at 21°N and to Guaymas Basin. The discovery of 350°C+ hydrothermal fluid pouring from “black smoker” chimneys in 1979 added a new dimension to hydrothermal vent biology: a tremendous diversity of microorganisms including Archaea growing above 100°C, and Alvinella pompejana worms living at temperatures up to 50°C. The Guaymas vents, spread over a large area of soft sediments, provided yet another set of habitats for new forms of hydrothermal vent life. My greatest regret from these expeditions is that we never had sufficient time to explore the full diversity of life in each area. Basic exploration for smaller organisms and new species took second place to more focused research objectives. The Galápagos investigators completed most of their work and at least partially answered their original questions: Life at vents was distributed primarily according to the flow and composition of hydrothermal fluid, so that competition and predation among the vent animals were less important than among similarly dense assemblages of animals living in shallow waters. Despite the high pressure and low temperature of the deep, the respiration rates of vent species were generally comparable to those in shallow-water animals. High concentrations of blood pigments, such as hemoglobin, were found in crabs, mussels, clams, and Riftia pachyptila tubeworms, compensating for the low partial pressure of oxygen at depth, and, incidentally, giving the animals with hemoglobin their vivid red hues. Karl Turekian’s Yale team showed that clams grew large and fast—22 centimeters in 10 years. Ken Smith demonstrated that mussels transplanted close to the vents increased their respiration and growth rates and stopped growing when moved away. All signs pointed to a highly productive ecosystem sustained by the ephemeral, high-energy flow of hydrothermal fluid. In his experiments, Holger Jannasch filled syringes containing radioactive carbon dioxide combined with vent fluids and incubated them over two days, proving that deep-sea bacteria used hydrogen sulfide from vent fluid to convert carbon dioxide into organic carbon, which they incorporated into their cells. We had not anticipated the presence of these chemosynthetic bacteria in the tissues of Riftia pachyptila, clams, and mussels. Discovery of these symbionts explained why these animals grew rapidly to a large size. A surprising variety of free-living chemosynthetic microorganisms was identified, and, per unit area, vents were found to be among the most productive ecosystems known. A central mystery—how larvae were able to find new vents nearly every generation—was partially answered by the early genetic study of mussels: Juvenile mussels were genetically quite different from older classes, indicating larvae arrive in pulses from distant vents. Although the diversity of species was low in comparison with other deep-sea environments, a remarkable number of new genera, families, and subfamilies was described from the samples collected. In general, life in the deep sea remains grossly undersampled and poorly known, and the mid-ocean ridges are not an exception. 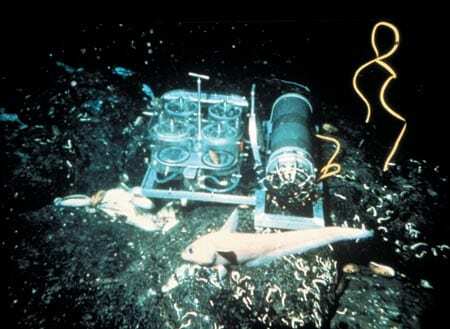 After many more expeditions in the two decades since 1979, biological studies have been conducted at 31 vent sites, but the distribution and habitats of most species are still not adequately described. In a review of the literature through 1998 that appeared in Advances in Marine Biology, V. 34, Verena Tunnicliffe (University of Victoria), Andrew McArthur (Marine Biological Laboratory) and Damhnait McHugh (Harvard University) found that 75 percent of the 367 species and 40 percent of more than 200 genera of animals known to occur only at hydrothermal vents have been found at only one hydrothermal site. This narrow biogeographic distribution of most of the vent fauna is intriguing, even though the unevenness of sampling and the great distances between sampled sites make any conclusions about faunal distribution uncertain. 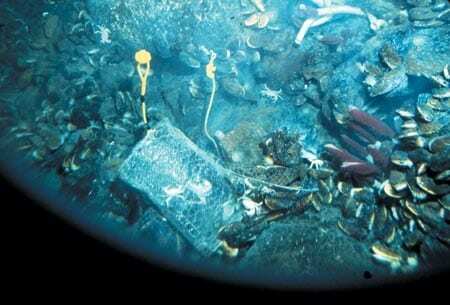 Many species and genera remain to be discovered from hydrothermal vents. Plankton sampling, further application of molecular techniques to identify and track cohorts of larvae settling at vents, and better understanding of the physical processes associated with vent plumes are making the processes transporting larvae to newly formed vents less mysterious (see Mullineaux/Manahan article), and rates of dispersal are beginning to be estimated. The study of vent microorganisms—on surfaces, below the seafloor, in the water column, and in association with other organisms—remains an important frontier. The diversity of microorganisms and their functional roles in the ecosystem are not yet well-described, despite more widespread sampling and the application of molecular techniques. We have subsequently learned that each segment of mid-ocean ridge has its own characteristic spreading rate and history of volcanic and tectonic activity, which lead to different patterns of hydrothermal flows over time and space, and to differences in chemical composition at various vent sites. This information provides the template for understanding processes controlling the evolution of vent fauna. The cycle of birth and death of individual vents and vent fields and their spacing along the mid-ocean ridge are not well-understood. Along with increased exploration of new sites, the next few years bring the hope for one or more seafloor observatories at hydrothermal vents. By continuously and simultaneously observing the biological, geological, chemical, and physical processes occurring at these sites, we can learn how all these processes interact. The greatest legacy of the first vent studies has been the collaboration of scientists from the many disciplines of ocean science to learn how a previously unknown ecosystem functions. This will be the model for discovery as other worlds are explored. A summer in a WHOI geology laboratory following his sophomore year in college started Fred Grassle’s career studying life on the seafloor. After 20 years on the WHOI scientific staff, he started a new Institute of Marine and Coastal Sciences at Rutgers University. Administrative duties brought an end to his hydrothermal vent cruises, but he still manages time for studying life on the shelf and deep-sea bottom off New Jersey. 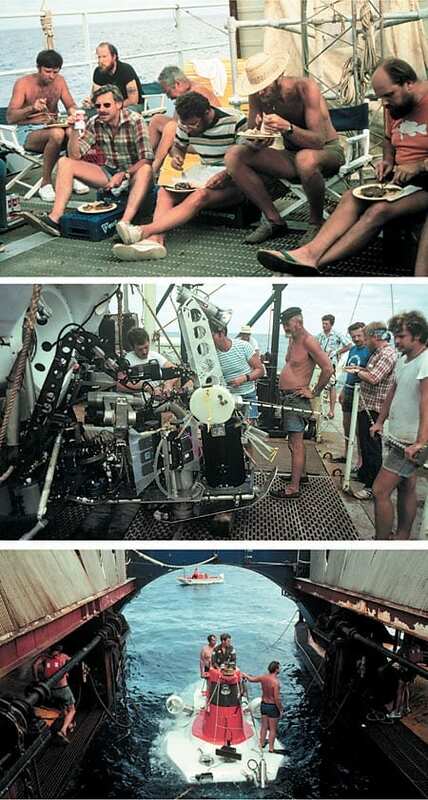 Top to bottom: Scientists from a wide range of disciplines (here pausing for an informal dinner on deck) assembled for the first expedition to study hydrothermal vent ecosystems in 1979. WHOI’s submersible Alvin was extensively modified to accommodate new equipment for the biological dives. Alvin 's deployed between the catamarans of its original tender, Lulu. 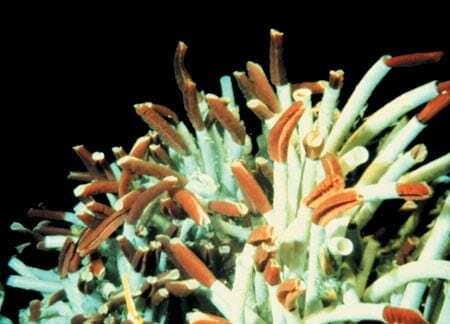 A flourishing colony of the red-tipped tubeworm Riftia pachyptila. 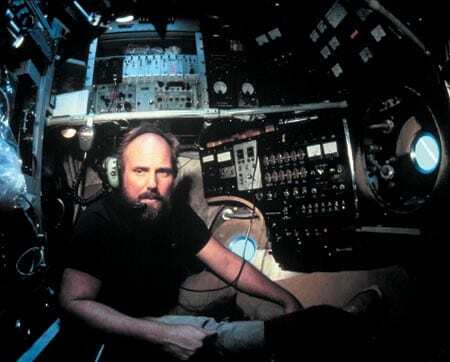 Biologist Fred Grassle dives to the vents in 1979 aboard Alvin. Minnow-baited traps proved quite successful for capturing crab specimens for physiological studies. 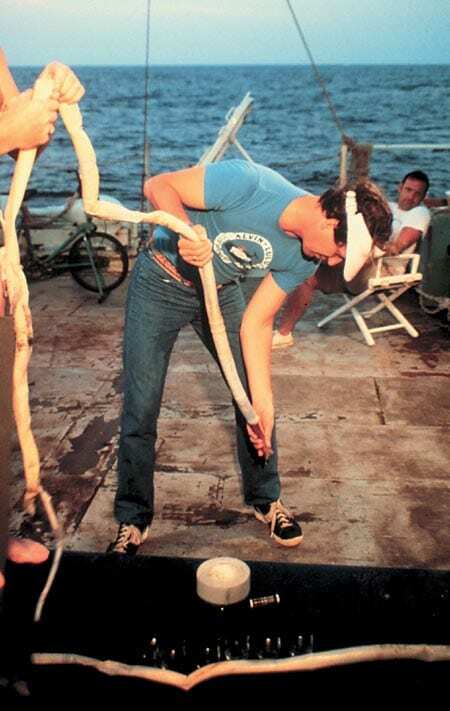 Bob Ballard examines a tubeworm several meters long, brought to the surface by Alvin.